In his 1959 address, "There is Plenty of Room at the Bottom," Richard P. Feynman speculated about manipulating materials atom by atom and challenged the technical community "to find ways of manipulating and controlling things on a small scale." This visionary challenge has now become a reality, with recent advances enabling atomistic-level tailoring and control of materials. 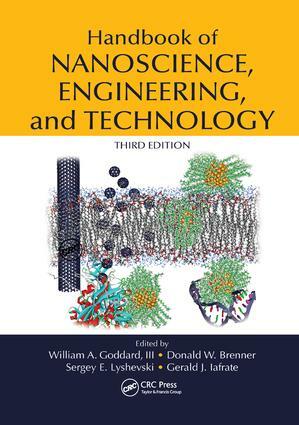 Exemplifying Feynman’s vision, Handbook of Nanoscience, Engineering, and Technology, Third Edition continues to explore innovative nanoscience, engineering, and technology areas. Along with updating all chapters, this third edition extends the coverage of emerging nano areas even further. Two entirely new sections on energy and biology cover nanomaterials for energy storage devices, photovoltaics, DNA devices and assembly, digital microfluidic lab-on-a-chip, and much more. This edition also includes new chapters on nanomagnet logic, quantum transport at the nanoscale, terahertz emission from Bloch oscillator systems, molecular logic, electronic optics in graphene, and electromagnetic metamaterials. With contributions from top scientists and researchers from around the globe, this color handbook presents a unified, up-to-date account of the most promising technologies and developments in the nano field. It sets the stage for the next revolution of nanoscale manufacturing—where scalable technologies are used to manufacture large numbers of devices with complex functionalities.